I was born in the north-east of England and despite living in Edinburgh for the last 15 years I still regard North England as my home. So, you can imagine my delight when we were kindly invited to stay at Headlam Hall – just a 10-minute drive away from my mum and dad’s house. Read our review to discover whether you think it’s worth a visit. 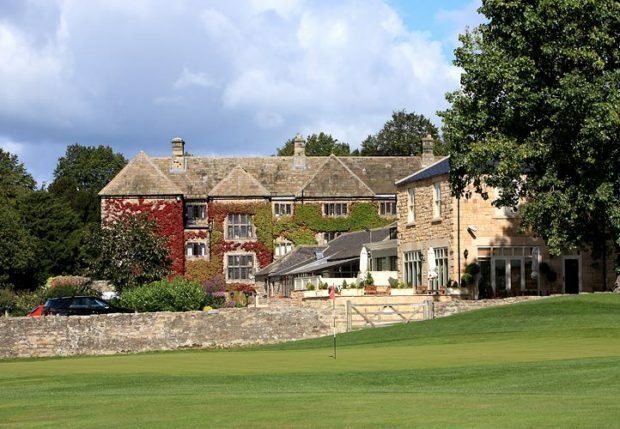 Headlam Hall Country Hotel and Spa is in the small but picturesque hamlet of Headlam, just between Darlington and Barnard Castle in County Durham. 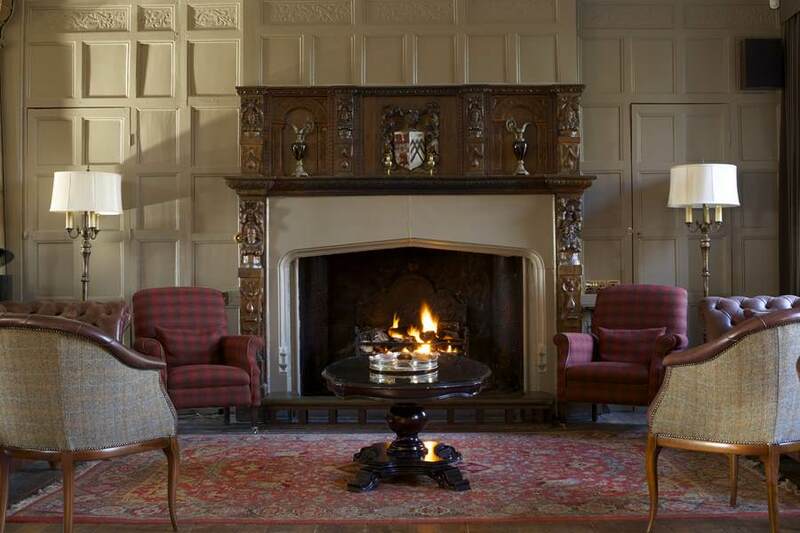 The estate has a fascinating history dating back to the 16th century and when the Hall itself was built (in the 17th century), Henry Birkbeck (the owner at that time) had a majestic oak fireplace installed in the main hall with the Birkbeck coat of arms displayed on the mantle. This was an elaborate gift to his wife but still stands proud in the main hall today and gains a lot of attention from guests. The Hall and the Estate are now owned by John and Ann Robinson, a local farming family who originally purchased the 200 acres of farmland to expand their neighbouring farm back in 1977. 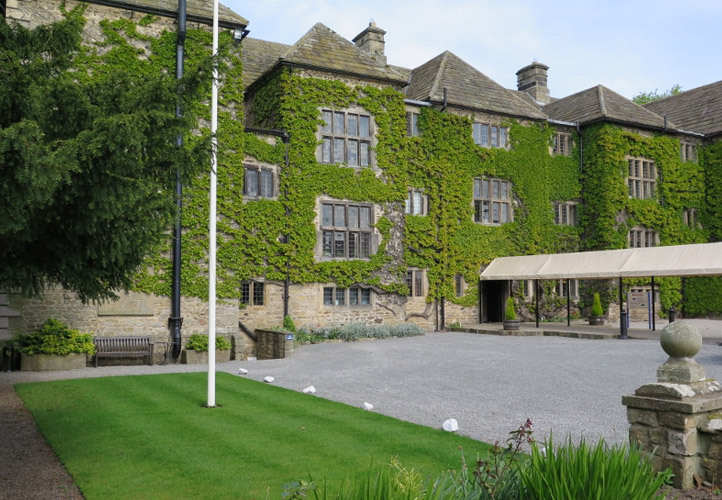 Since then there has been a lot of change, a lot of hard work, a lot of investment and a lot of care and attention to transform Headlam Hall into the well reputed hospitality establishment it is today. The drive to Headlam Hall comprises of converted farm buildings, roaming hills, stone walls, an expanse of green fields and wooden gates and they all reaffirms that this is very much a country house and upon stepping through the big oak door of the main entrance it is clear to see that it is a handsome one at that which has retained many original period features; the majestic fireplace in the main hall being the most prominent one. Stone windows, concrete columns, hand carved wooden furniture and period ‘soft-furnishings’ all added to the tasteful old worldly vibe. Brian, the Concierge was right on hand to take us through to reception, where a friendly quick and easy check-in took place. He then carried our bags to our room, there are 38 in total across the estate, all named after the local area of key figures in the local area. 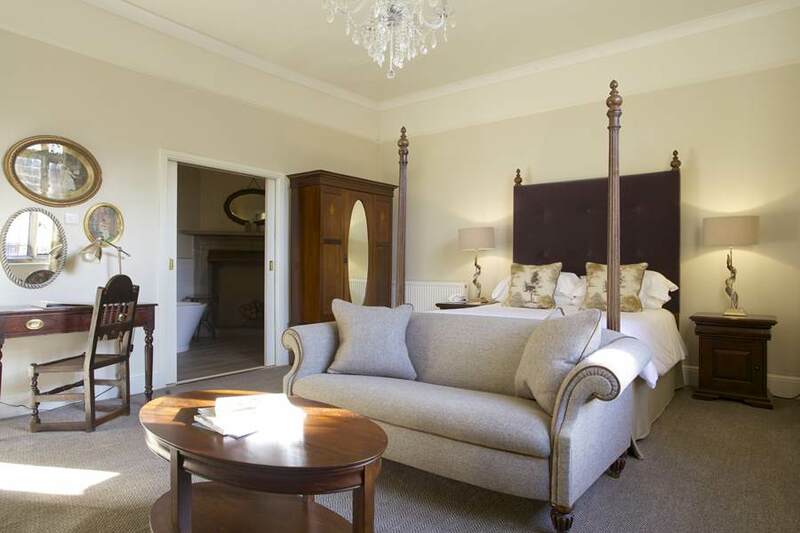 Our room was a double overlooking the gardens that lead out onto the village green entrance of the estate. It was a lovely outlook and very peaceful. Big heavy curtains adorned the original stone windows so when we drew them closed the room was really dark which made for a great night’s sleep. The room was comfortable, with all the usual amenities a guest needs for a pleasant stay. A cast iron fireplace was housed on one wall, but it was no longer in use but I can just imagine back in the day huddling around it for warmth. The décor was in keeping with the rest of the traditional interiors. The bathroom was comparatively modern, extremely clean and presented a selection of Molton Brown bath and shower gel and shampoo. Bathrobes were also provided but as the Spa facilities was across the car park in a different building we decided to keep these for in-room use only. 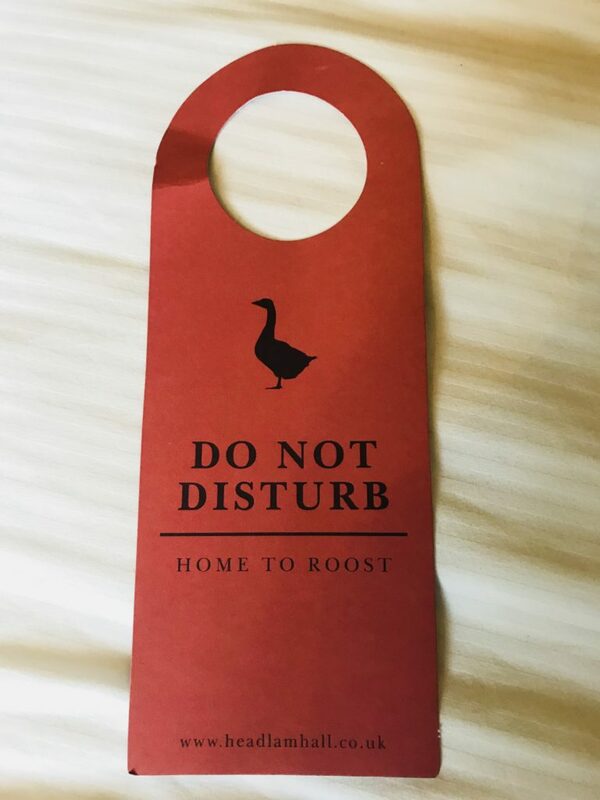 The room service door tag was great and very in keeping with a county house theme. 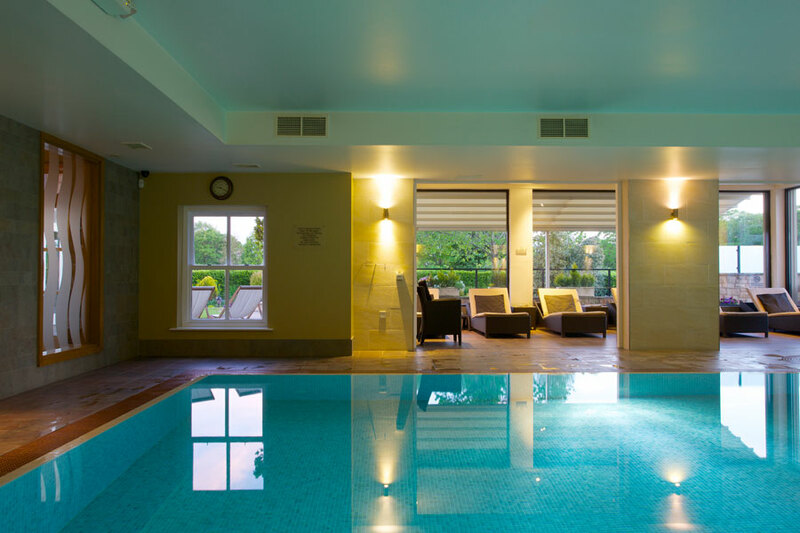 The spa is situated just a short walk from the main house, past the coach house and across the car park. 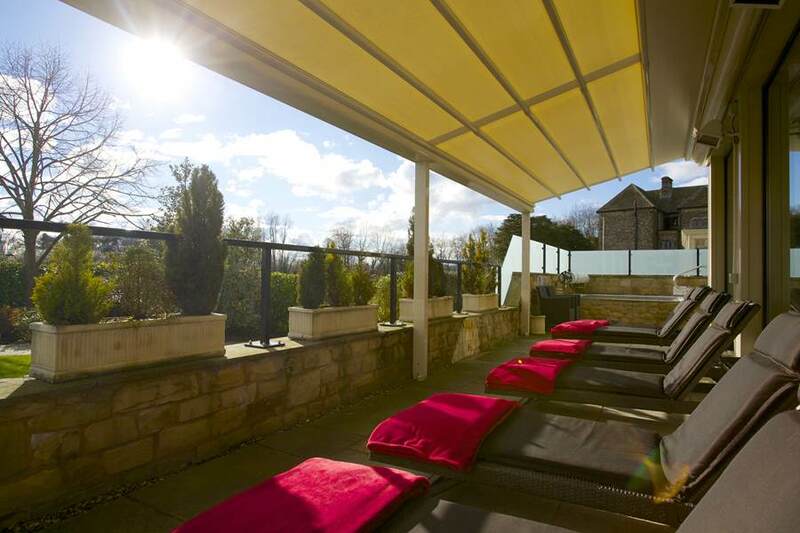 The spa comprises of a rustic, welcoming and relaxing lounge area, 15m indoor swimming pool, sauna, steam room, outdoor Jacuzzi and outdoor loungers, which on a warm day would have been lovely to enjoy the views of the roaming countryside in the sunshine. There are also five treatment rooms (one duo room) and Elemental Herbology, a niche British brand, is one of their chosen product ranges used for spa treatments. We didn’t indulge in a spa treatment but the scent of the burning incense candles throughout the spa area was very relaxing and I can imagine how wonderful a full treatment would be. The Spa is open to hotel guests, members and day residents too. 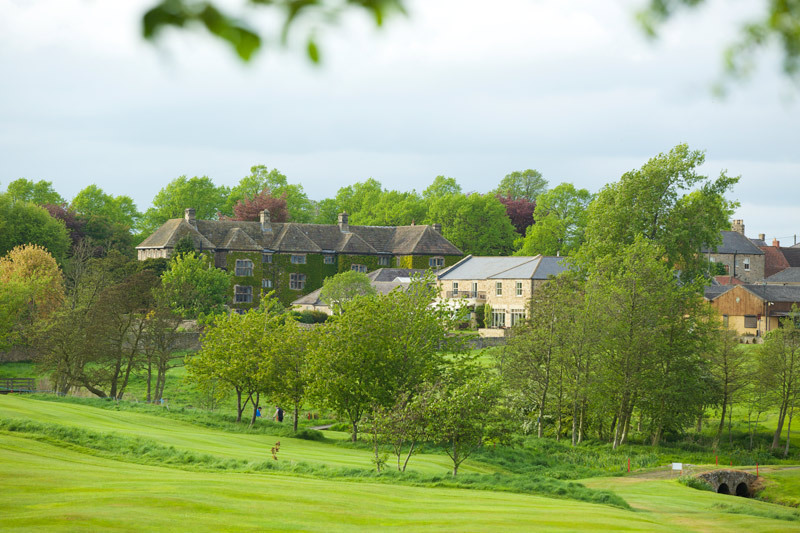 Although we didn’t partake there is an outdoor tennis court, 9-hole golf course and driving range, croquet lawn, classic car hire service, small gym, bicycle hire and several local walks. Not to mention all the local attractions in County Durham and the North Yorkshire Dales just a short-drive away from the hotel. For those guests making a flying visit there is conveniently a heli-pad on site too. I should have paid more attention to the dining options here before we arrived as I wasn’t expecting it to be quite as formal or quite as good! There is a smart casual dress code in the main restaurant, however the ambience and service is definitely more on the smart side than the casual. Prior to being seated in the restaurant, we were shown to The Library Bar (in fact Brian made sure this was the first point of call when we arrived!) a traditional set up, in keeping with the rest of the hotel and situated between the main restaurant and the main hall / lounge area. We enjoyed a G&T (a local batch one) whilst the waitress talked us through the menu for the evening; as all produce is local and seasonal the menu frequently changes. There was a good selection of fish and meat dishes for both starters and main course and it was difficult to choose. After placing our order, we were then asked at what time we’d like to go through to the restaurant and were given an extensive wine list to choose from. The bar tender was extremely knowledgeable and happily advised on a wine that would complement our menu choices. Right on cue as the clock struck eight we were escorted to our table in the lovely restaurant. The décor, interior and the garden-room like set up of the restaurant meant that it was bright and quite contemporary, although there was a hush-tone ambience. Fellow diners were of a mixed audience type; hotel residents for both leisure and business along with locals too. The clientele appeared to be more on the mature side. 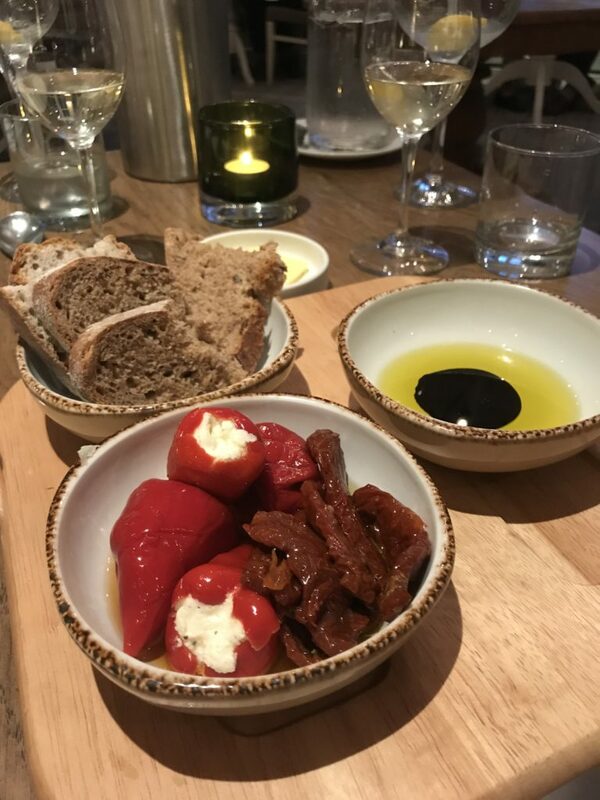 A bread board with a selection of freshly baked breads (and we added a mediterranean side) was presented followed by a mushroom and tarragon amuse buche. With an appropriate space of time we were then served our starter of pan fried scallops, roasted garlic and pancetta which melted in the mouth. 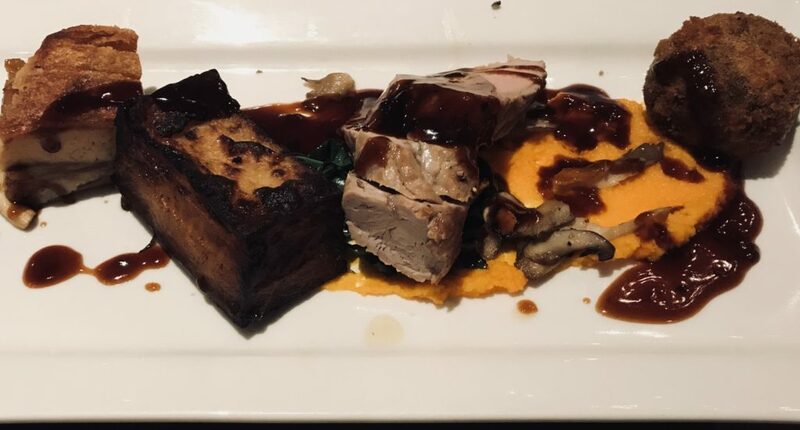 An apple sorbet helped cleanse the pallet before we were presented with the main course; pork fillet served with slow cooked belly and black pudding bon-bons with sautéed wild mushrooms, fondant potato, carrot puree, cabbage and sage jus. Wow! Wow! Wow! It tasted even better than it sounds, if that is possible. I really wasn’t expecting such a fine-dining experience. The restaurant is award winning and with this dish it is easy to see why. 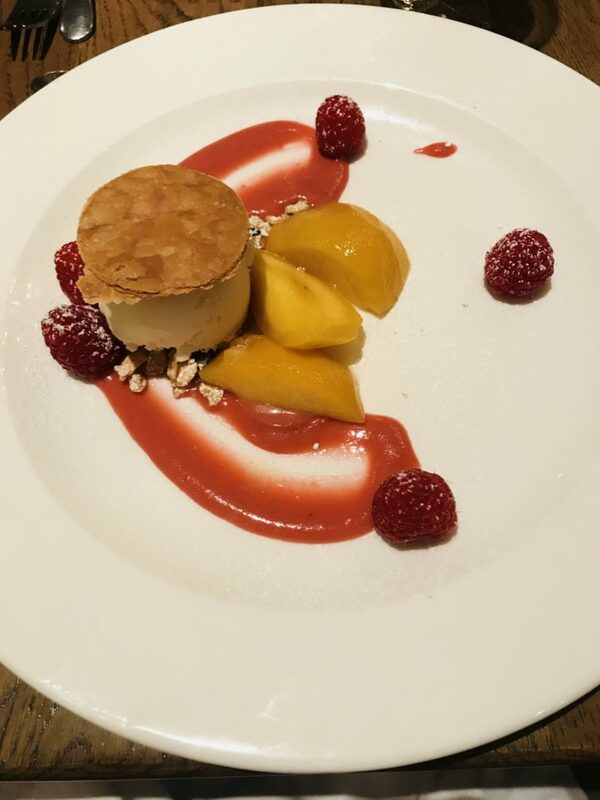 For dessert, we enjoyed a cheese board which comprised of a selection of five local cheeses and home-made chutney along with fresh peach with raspberry, almond and pumpkin seed granola and puff pastry ice-cream. They were very tasty and a sheer indulgence really. In addition to the restaurant there is a choice of private dining rooms in the Main Hall for up to 40 diners and larger events are accommodated in the Coach House Suite located across the courtyard and accessed via a covered walkway. Breakfast was also served in the restaurant and comprised of a cold buffet; the usual cereals, croissants with home-made jam, fruit and traditional cooked breakfasts could be ordered from the menu. 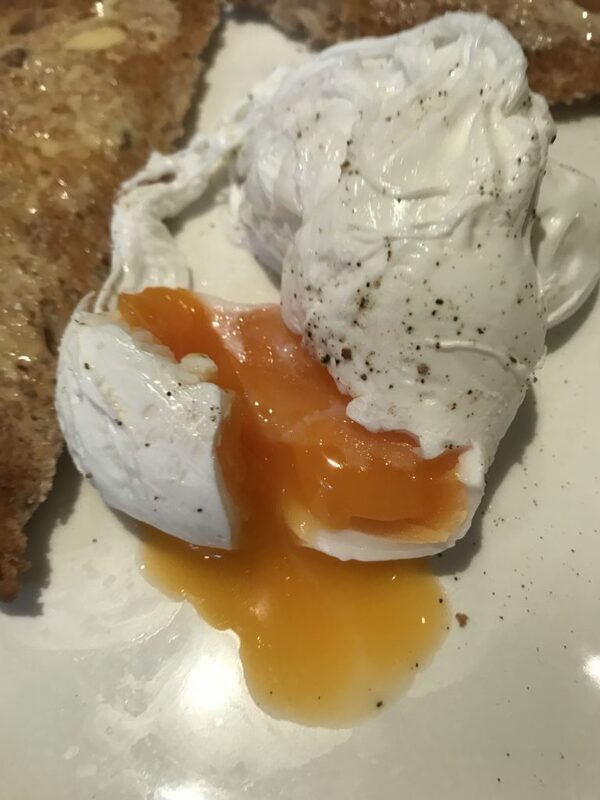 After such a delicious meal, the night before I was struggling to fit in the full EB so opted for poached eggs on toast. This wasn’t on the menu but the team kindly obliged my request and I am so glad they did. These were the best eggs I have ever eaten!! Rich, orange yolks – you could tell these were from well-fed happy hens. My sister couldn’t resist the full breakfast and applauded its quality. 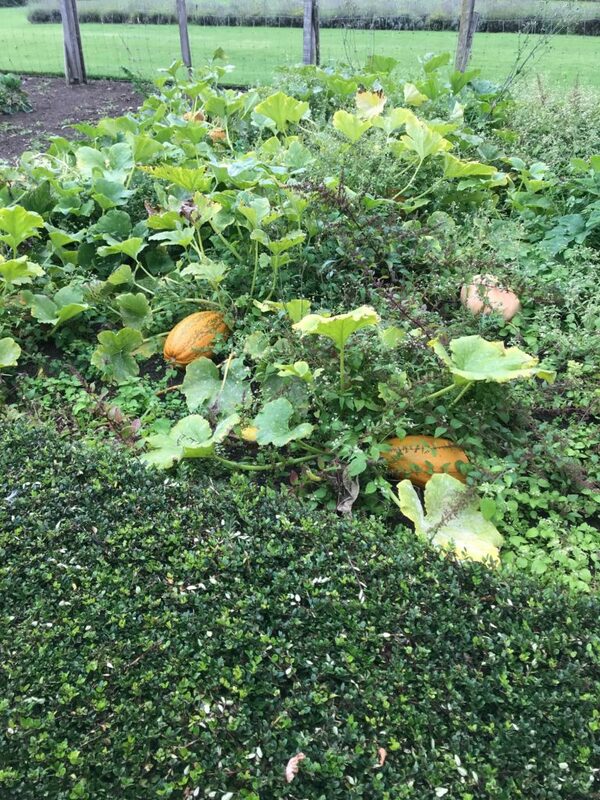 The kitchen here uses a lot of produce grown in its own gardens, for example the incredibly succulent plum jam, and if you choose to explore the grounds you’ll see the orchards and vegetable patches. I love this element! I’d really like to go back and sample the Sunday Roast; maybe next time I’m visiting home I’ll pop by. 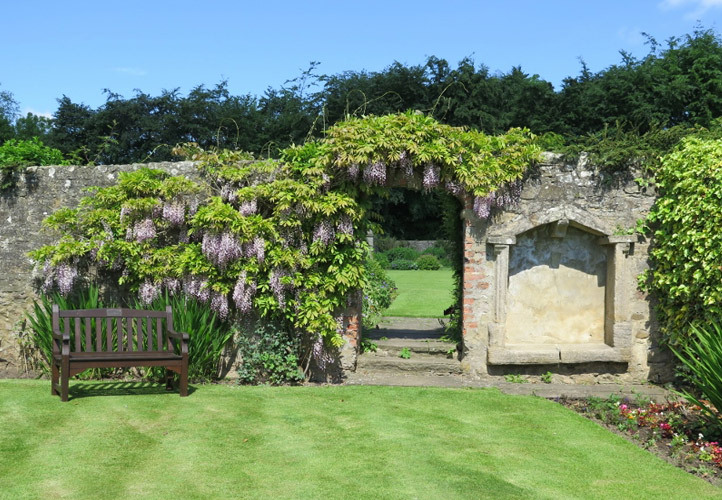 The walled gardens are set in four acres of land and are just beautiful. 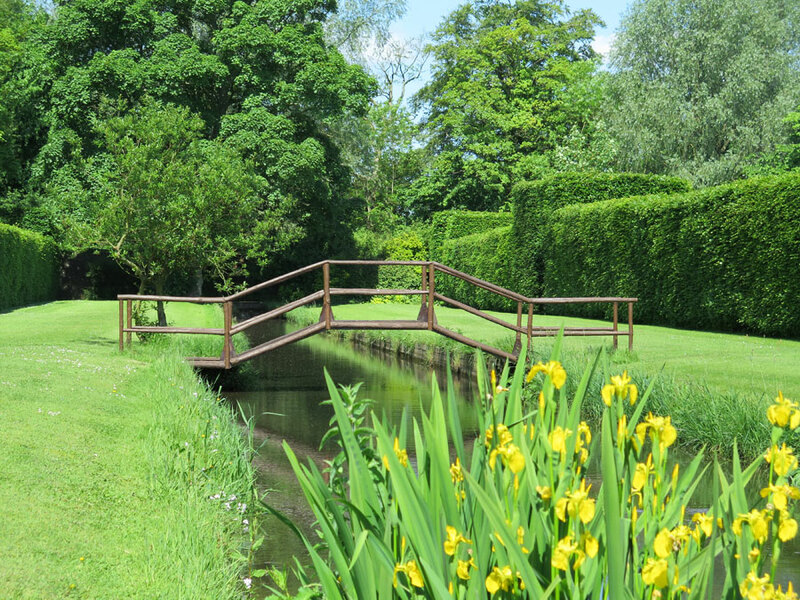 They are very well maintained and are reminiscent of a tranquil magical fairy tale; high hedges, hidden nooks and crannies, stone walls, wooden bridges, ornamental canal, ancient trees routes – I felt like I was in Alice’s Wonderland. However, we didn’t venture on any of the local walks (I didn’t pack the right footwear!) but if I go back I would make time to do so. 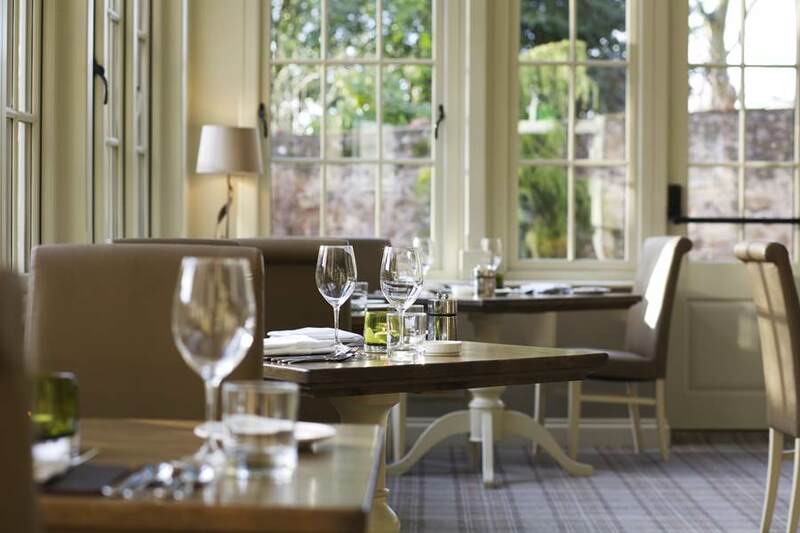 If modern luxury is your thing then this is not for you, if however, you like a nod to tradition andgreat British heritage and want to enjoy some peaceful time with amazing food and good old northern hospitality then we highly recommend you pay Headlam Hall Country House and Spa a visit. I’d definitely go back (especially for a Sunday Roast and long walk).